Photo by rawritzrichii, not to be reposted without the original photographer's express permission. 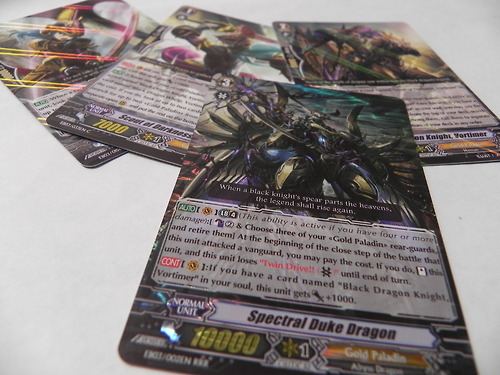 Introduced in EB03: Cavalry of Black Steel, the Spectral Duke Dragon line is a formidable deck that's taken the English pro scene by storm, with many offshoots and variants emerging in a Gold Paladin race toward the perfect Duke deck. While many pros have had their eyes on these cards as a result of their strong turnout, it's important to carefully examine the strengths and weaknesses behind the deck, rather than assuming its strength based purely on tournament performance. The typical choice of first vanguard for this deckbuild is Black Dragon Whelp, Vortimer; while he shares Kyrph and Spring Breeze's outrider skill, unlike those grade 0s, Vortimer is a 4000-power unit and so can't normally form a 15-16000 line. He's dependent on an 11000-power vanguard for the 15000 baseline, and while the Duke Dragon build does have one for him to line up with, if your game is going well then you'll never see those two cards paired together. The reason for that is that Vortimer comes from the Riviere form of evolving ride, here intended as a direct homage to Fullbau and the Shadow Paladins. His other skill is that when ridden over with the grade 1 Scout of Darkness, Vortimer, he can look at the top 7 cards of the deck for either the grade 2 Black Dragon Knight, Vortimer or the grade 3 Spectral Duke Dragon. There are two improvements here over Fullbau, most immediately that if you miss your opening ride with the Scout, he can still move to the rearguard and provide the one-card advantage that's been standardized across the game. The second is that Vortimer can target either the grade 2 or 3, which gives him a wider variety of targets that can help to ensure that having one or the other in hand already will let you concentrate on the missing card. Vortimer's new evolution model does have several weaknesses. First, because the increase in advantage is not guaranteed when you ride the Scout of Darkness, it can create the awkward situation of riding the Scout but still missing out on the Knight or Duke Dragon. Like Fullbau, the Black Dragon Whelp increases its vanguard grade 1's form's power up to 8000 when when the grade 0 is in the soul, but that isn't really the kind of consolation prize that makes up for his on-ride skill misfiring. The third is that the lack of a guarantee means that four copies of Black Dragon Knight and Duke Dragon are required in every deck that utilizes the grade 0, taking up slots that could be better devoted to other cards. Part of this is also due to the general weakness of the grade 1 and 2 forms--the trade-off for having 7000 power and unique skills on the grade 1 of an evolving line is that this member in the series no longer has the ability to add the grade 3 of the line to the hand by discarding another grade 3 of the same clan. For the Shadow Paladins, drawing any grade 3 was drawing Phantom Blaster Dragon, because of Blaster Javelin's skill; but for their Gold Paladin equivalents, the grade 0 must be relied on for deck searching. Also unlike with Riviere, the evolving line is not intended as the main line of Gold Paladin play, and their support cards are not geared for dealing with the grade 0 outriding from the soul. You can't bounce Vortimer in the hand for an extra 10000 shield like you can with Riviere. The FVG itself doesn't do very well on the field and leaves you very vulnerable to Stil Vampir, but as we'll eventually see, there is one way to make use of the extra card later in the game. Because of these weaknesses, the grade 0 Vortimer is sometimes passed over in favor of Kyrph, who has 5000 power, is guaranteed to move to the rearguard and ties into Gareth and Beaumains, both of whom are already important to Gold Paladin decks as a whole. Since the grade 1 Vortimer's unique skill relies on his grade 0 form, but the grade 2's does not, using an alternate FVG provides more overall consistency since it gives 5000 extra power for support, a more reliable increase in card advantage and alternate means of maintaining that advantage through skills. If running Kyrph, a single or double copy of Ezel is generally recommended so that his superior ride can go off on occasion. Other fighters prefer Spring Breeze Messenger, but the reasons for this are somewhat more complicated and will be detailed further down. The Scout of Darkness himself has his own skill to be concerned with. When you ride him with Black Dragon Knight, Vortimer, the Scout can retire one Gold Paladin rearguard to look at the top two cards of the deck and superior call up to two cards from among them. This is a little cumbersome to use, since it requires you to have called a rearguard on the previous turn and so kept a grade 0 or 1 in hand for the occasion, but if you're getting out the Scout's opening ride in the first place then it will generally go off. Because of how early in the game this takes place, the most likely cards you'll get out of this are trigger units. Since member in the Vortimer line gains power from having the previous one in the soul and there are several cards in Gold Paladin that can gain power when attacking, they're fairly okay for boosting purposes, but the key point here is that this builds on the existing advantage from the first two Vortimers, jumping up from +1 to +2. Keep that in mind as we move along. The first grade 1 outside of the evolution line that really catches the eye is Blackmane Witch. While she's a promo card, Blackmane is one of the most subtly important grade 1s that the Duke Dragon build has. Her skill is to retire a Gold Paladin when she's called or ridden, to superior call the top card of the deck if it's also a Gold Paladin. That doesn't convey a direct increase in advantage, but consider that because of how skill resolution operates, as in the example of LuLu and CoCo, you can move the Black Dragon Whelp when you ride Blackmane Witch and then activate the Witch's skill immediately afterward, retiring that 4000-power unit for another. As with Ezel, the key here is to play with minimums; no non-FVG card in the entire clan has less than 5000 power save for Falcon Knight of the Azure, who gives +2000 power when called. So no matter what unit you call with this skill, you are gaining a minimum +1000 power in the process, and by playing with that minimum you can prepare a 16000-power vanguard line or in rare cases call very powerful units on the first turn. A Spectral Duke Dragon deck that uses Blackmane Witch, Gareth, Vortimer and Mark as its grade 1 setup has the advantage of having no bad opening ride. Mark is an unavoidable risk that every clan has, but Vortimer and Gareth both give 8000 power for dual offensive and defensive purposes, Vortimer has skills to be used when ridden and Blackmane can at the least increase the amount of power behind your backrow while having the potential for a frontline offense. Moving into the grade 2s, the Black Dragon Knight that I've mentioned has two skills, like Blaster Dark before him. First, he gains +1000 power in the vanguard circle when Scout of Darkness is in the soul, for a 10000 total that demands boosting units out of the opponent. Second, when he's ridden over with the grade 3 Spectral Duke Dragon, the Knight can retire one Gold Paladin to superior call the top two Gold Paladins of the deck. Like the Scout, that skill is intended to build on an existing advantage, in this case turning Vortimer's +2 into a +3, and while the calls are randomized and could be anything from Garmore with Charjgal to Elixir Sommelier and Silent Punisher, the existence of an advantage is the main factor in play. The fact that you're retiring one unit each turn with these skills opens up the field considerably, giving you greater freedom of calls, but in the same breath it restricts you from filling too many spaces lest the increase in advantage that you were about to gain be nullified by having to call those units to inappropriate spaces or by having to retire other units to make room for them. The card introduced with the chief purpose of supporting these two Vortimers is Flash Edge Valkyrie, a grade 2 who when superior called from the deck, can counterblast 1 to superior call the top card of the deck to an open rearguard circle. That skill is already very similar to the Vortimer line with its randomized +1, but even further restricted since any Flash Edge in hand becomes practically a dead card. To circumvent this is her grade 1 counterpart, Blade Feather Valkyrie, who when boosting the attack of a Flash Edge that hit, can counterblast 1 to superior call another card. These two skills would not be so bad for what they build toward, but the weakness in these cards is that Flash Edge has only 8000 power, not 9000 like Viviane, so the line that the two Valkyries can form is 15000, just 1000 short of opposing 11000-power units. The cumulative counterblast costs are also relatively expensive for what the cards do given their limited offensive potential and narrow constraints, making Viviane the preferred support card by far. The reason that we've been building up all of these randomized extra cards with no regard to what cards are actually being called, is the card that brings all of these skills together. Readers familiar with the Shadow Paladins will already have some idea of where this lesson has been headed from the beginning, with each card in the evolution stockpiling an advantage for the grade 3. If Blond Ezel is our Alfred, then Spectral Duke Dragon is our Phantom Blaster Dragon, and the skills match. Spectral Duke's first skill is to gain +1000 power continuously for having Black Dragon Knight in the soul, creating the only base 11000 unit that Gold Paladin will have until BT09. To support that we have War-horse, Raging Storm, who is a Hare of Inaba-type card, meaning that he allows you to soulcharge a unit from your hand when called. This is important because it solidifies Duke Dragon as a consistent base 11000 at the cost of card advantage, but the loss of that one card can be turned into saving as many as two or three by only needing 5000 shield to guard certain attacks. Raging Storm may not be essential for the Duke Dragon build, but it will probably see wider play in the future as crossride units are introduced for the Gold Paladin clan, and should be kept in mind for those occasions. Spectral Duke Dragon's second skill is perhaps one of the most devastating in the game. At limit break 4, counterblast 2, he can retire 3 Gold Paladin rearguards at the beginning of the close step of a battle in which he attacked a vanguard, to stand. This skill does not check for whether his attack has hit or not. Because of that, it disregards any and all shields the opposing cardfighter has put down and stops perfect defense cards dead in their tracks. Duke Dragon does lose twin drive in the process, and so only drive checks one extra card for a -2 overall, but can still check for one more trigger while retaining the effects of any previously put on him, and while the opponent could drop a second perfect defense to stop him, that's going to cost them a total -4 for the turn just to stop Duke Dragon while you're only at half of that for using the skill. That hit to advantage is a big deal however, as it can leave you totally unable to defend yourself or form any time of secondary attack on followup turns, hence why it does not matter what cards were superior called by Vortimer and the Valkyrie sisters or Viviane. This even provides a use for if you miss your Scout rid eand sitll have the grade 0 Vortimer lingering on the field. No matter what was called, it's nothing short of fuel to support the limit break once the opponent hits 4-5 damage. There are several unconventional things about the build's star card. Little Battler, Tron is still a recommendable booster despite the loss in field advantage because making the first attack powerful enough to demand perfect defense cards is important. There can be no direct Nemain or Badhabh Catha equivalent for Spectral Duke because his retire takes place during the attack step, not the main phase. And Trigger bases for Duke are tricky because of that same phase issue. While many successful cardfighters like Brandon Smith have staunchly advocated for critical triggers in the deck, and draw triggers are a necessary element due to the losses incurred by the Dragon's skill, stand triggers are nonetheless very valuable in a deck that can reliably stand its vanguard. A stand trigger to Duke becomes a minimum +10000 extra power when applied to his rearguard booster, since the standing booster will now be able to give him both its own power and that of the trigger, easily forming a 21000-power line, or even 23000+ with a boosting unit that has 7000+ power. On the other hand, this same strategy hurts using Tron as a booster over Gareth, since with Gareth, Duke can go for 23-24000 instead of being stuck at just 19-20000 due to now having less rearguards than the opponent. Due to the opponent being continually worn down by the vanguard attacks, having a strong rearguard becomes important here for finishing them off, and it also makes Gigantech Destroyer more usable over Manawydan since he can go with those same stand triggers for 17000 unassisted. But on the other hand, with a critical trigger Duke can deal as much as four to six damage in one turn. Duke retains the entire trigger effect between attacks, meaning both power and critical. The prospect of facing multiple critical-2 attacks and not being able to take a single hit even at four damage is very daunting for the opposing player. And the biggest hit that Spectral Duke Dragon will take in the future is versus crossride units. He lacks the serious power gain of Garmore and Ezel, which makes fighting on even footing with The End and Phantom Blaster Overlord difficult. Tron will most likely be no longer recommendable in that format, since 21000 to Duke versus a crossride is exactly the same as 18000 with less restrictive units like Scout or Sleygal Sword, and Gigantech Destroyer will probably vanish as well since he can only go for 12, not 18000 with a stand trigger. Stands as a whole are more useful to the build now than they ever will be in the days to come. One way that was devised to circumvent the cost of his skill was through Providence Strategist. Credit for the innovation goes to the Dallas regional champion, Thomas Cassidy. While Strategist can't exceed 15000 power even with Gareth, the opponent feels pressured to block the card when they could have otherwise taken damage because of his draw skill, and the moment that they don't block it is the moment in which Duke starts accruing new cards to offset the retire cost. By the end of the turn Strategist is no longer on the field, forming a hit-and-run line that immediately creates replacements for the cards lost--in other words, Strategist becomes a free sacrifice. I mentioned Spring Breeze toward the beginning, and now that we've covered Duke's skill it's time to get into what can be done with him as the FVG. Spring Breeze's own skill as you'll recall from our previous article, soulcharges himself to perform a slightly more complicated superior call than noraml, when the attack of the unit that he boosts hits a vanguard. The immediate use for this is to have Spring Breeze boosting Duke Dragon, so that if Duke's attack hits he can soulcharge himself to call a new boosting unit for the dragon, effectively gaining half the use of a stand trigger without having to actually run stand trigger. Even if the unit doesn't suit those purposes, it can still become a sacrifice, as the act of hitting the vanguard takes place before the beginning of the close step of the battle. Another way to use Spectral Duke's skill is with Viviane or the Valkyrie sisters. Their use has been called the most advanced technique of the Duke Dragon build, and it's certainly earned the reputation, requiring five open counterblast to go off. These cards share a characteristic of superior calling a unit from the top of the deck on-hit, and how we exploit this is to have the opposite rearguard column attack first, followed by Duke Dragon, and then activate his limit break to retire that column plus his boosting unit. Following this, Viviane or the Valkyries attack. If their attack does not connect then the combo ends there, but if it hits you can then counterblast 1 to superior call a third unit--ideally a boosting unit, but also potentially an independent attacker like Gigantech--and then attack a second time with Spectral Duke Dragon. Following that attack, Duke activates his limit break for the second and final time, retiring Viviane or the Valkyries plus the unit they just called. The main advantage to this is being able to break past two perfect defense cards and get four chances to check triggers, maximizing the potential power and critical of Duke while straining the opponent's resources immensely. The cost is most towering for yourself however, costing a total counterblast 5, -4 cards, a price that is arguably more than that of the less-tangible costs paid through megablast. If the opponent is not absolutely ruined by the serial blitzkrieg, then it has failed and you will most likely have to resign the game soon. Viviane is preferred for this technique due to being able to reach 16000+, unlike a Valkyrie line. The Duke Dragon cards are a very interesting and strategic use of the card types originally developed by the Shadow Paladins, but their play is fundamentally different and requires advanced understanding of the game to master. Careful trigger counting is definitely required to play them well, and with the upcoming announcements of BT09's Japanese release, we'll likely see many advancements to the clan's play style in the days to come. The greatest weakness of the build is also its greatest strength, as the success or failure of an initial Vortimer ride can spell doom for either yourself or the opposition. The strongest comparison these days is ShadowPala operating as a single coin flip versus Spectral Duke's multiple die rolls; the odds act in favor of the original style, not the new one, and the high-risk, high-reward nature of the Vortimer line and Valkyrie cards make it a very difficult to play a "luckless" Duke Dragon deck. Weigh the difficulty of playing the deck carefully with the guarantees brought to the table by other clans like Great Nature or the Dark Irregulars, before attempting to command this deck. Nineteen pros use this deck.